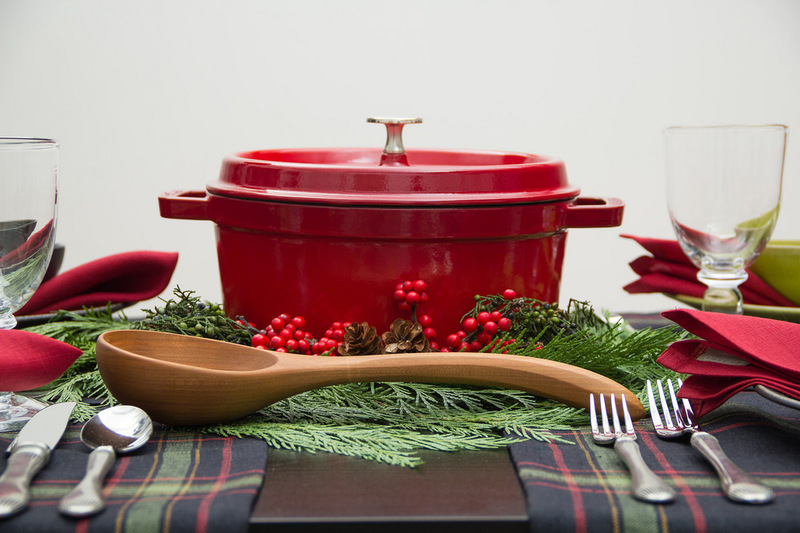 This blog post marks our first submission by guest blogger & table designer Toyoko S.
Are you hosting a holiday dinner and looking for some ideas? 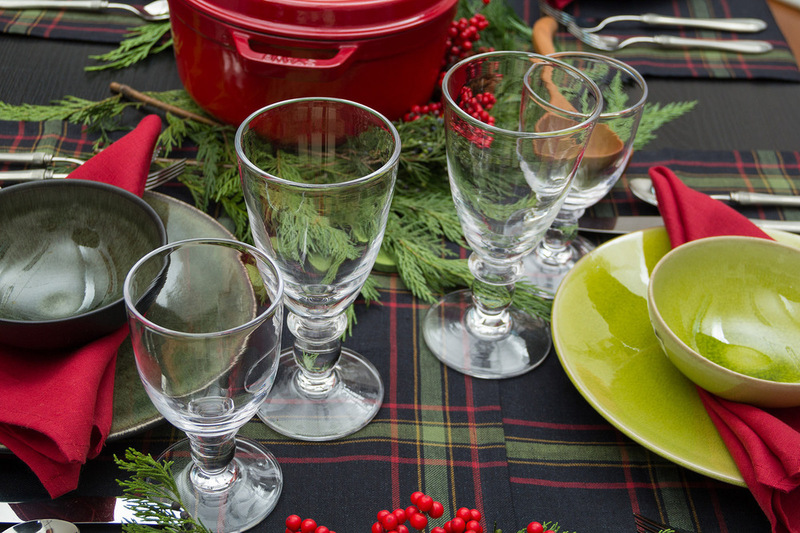 I would like to show you a holiday table or two in a few blog posts for some inspiration. 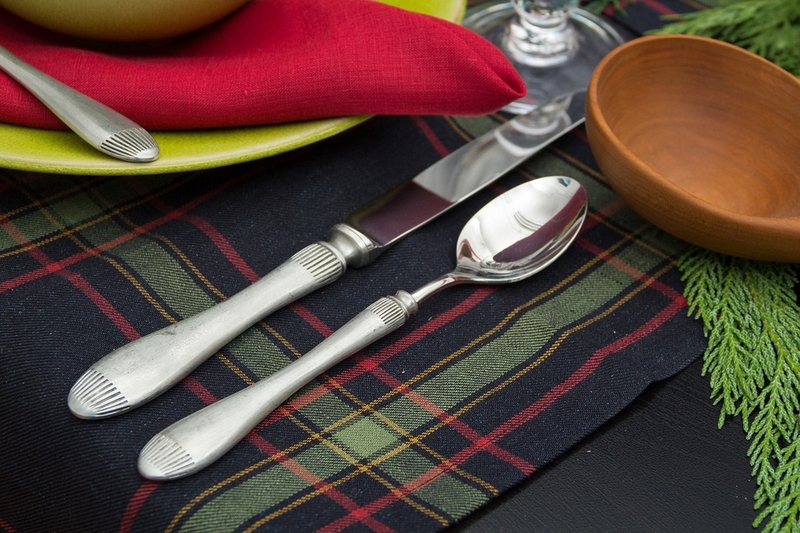 This table setting is inspired by the Libeco Home Blackfriars table linen pattern. The earthy color combination and the texture of 100% Belgian linen is the base and star of this table. 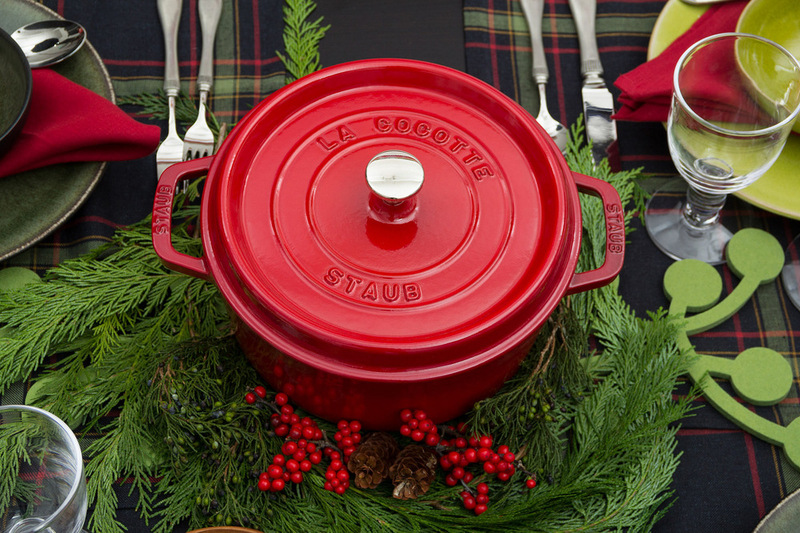 The bright cherry color of the Staub dutch oven (cocotte if you are French) itself makes the practical oven-to-table center piece. Imagine you are about to be served a hearty soup or beef stew at the table with your family or close friends… I used Jars France Tourron dinner plates and bowls in two colors, Avocado and Samoa for variation. 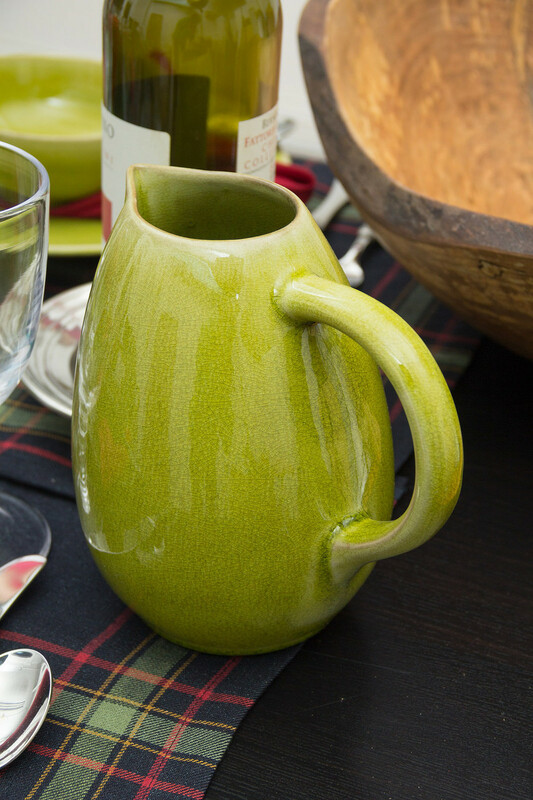 There is the matching Avocado color water pitcher as an accent. 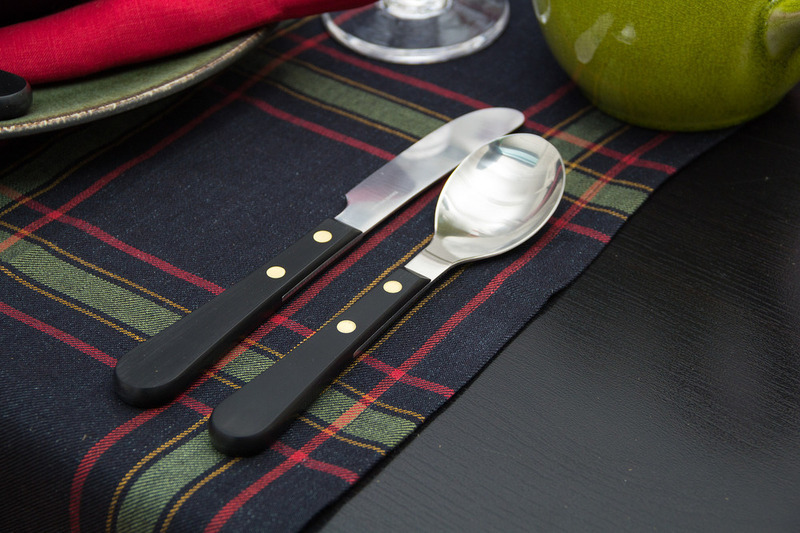 I think David Mellor Provençal flatware's handsome black handles accent this colorful table the most, though I am also showing Match Pewter's Daniela flatware as an alternative. To emphasize the earthy ambiance, I used Spencer Peterman's wooden salad bowl and J.K. Adams Heritage Colonial Board as a base for pillar candles. Simon Pearce's Hartland stemware seems well in keeping with this setting, and brings a modest sparkle to the table. 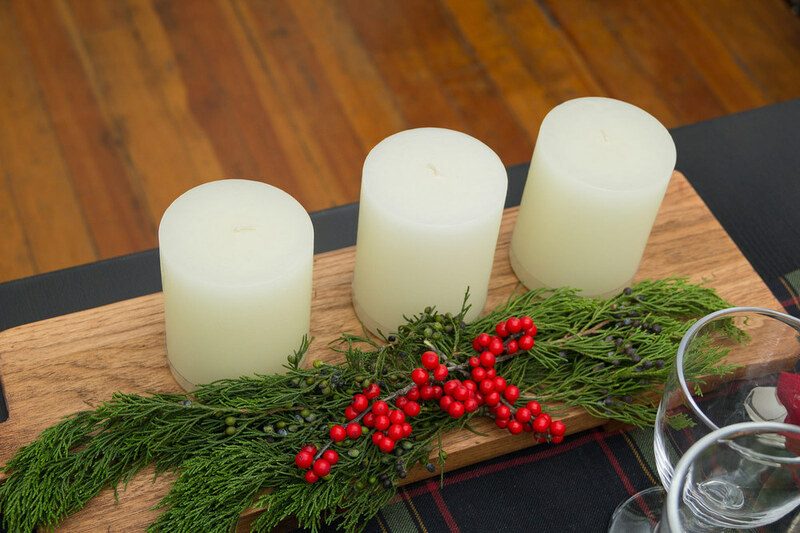 Now, you can create this festive yet earthy table without any flower arrangement for the center piece. 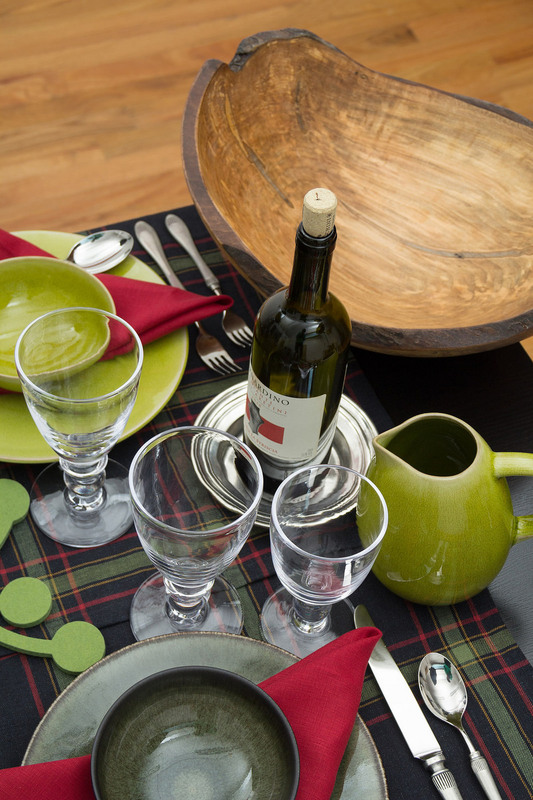 Libeco Home Polylin blend napkin in red, Jonathans spoon's medium ladle, Verso Design Marja large trivet in green, and the Match Pewter wine coaster. -Guest Blogger, Table Designer: Toyoko S.